As I mentioned recently, for Star Wars fans, Disney’s Hollywood Studios is going to be the place to be coming up this winter at Walt Disney World. The fun will be staggered, but begins soon – December 1. Actually, some of the fun has already started, as the new scene and other fun surprises have already been added to Star Tours: The Adventures Continue. Located in Animation Courtyard, the Star Wars Launch Bay will be a primary location within the park for fans to celebrate all things Star Wars. 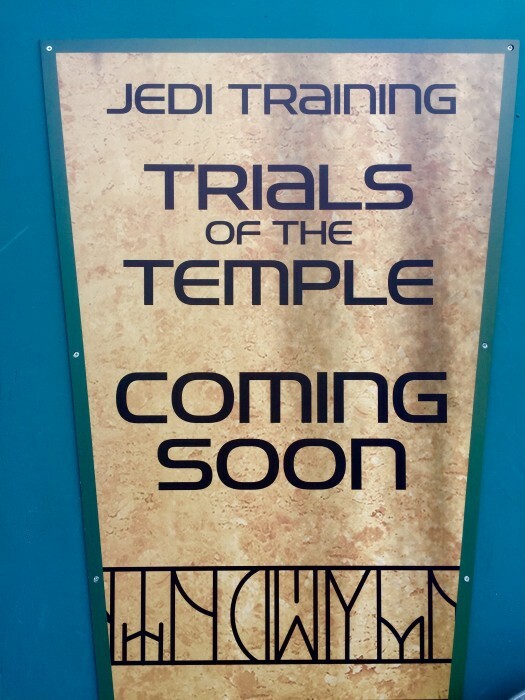 Guests will be able to see special concept artwork, interact with beloved Star Wars characters, tour galleries featuring treasured memorabilia and replicas of large-scale Star Wars artifacts, including ones from Star Wars: The Force Awakens, and play the latest Star Wars interactive video games, plus you’ll of course, have access to special Star Wars merchandise. Character Meet and Greets: Guests will enter and be able to see replicas of Star Wars props. 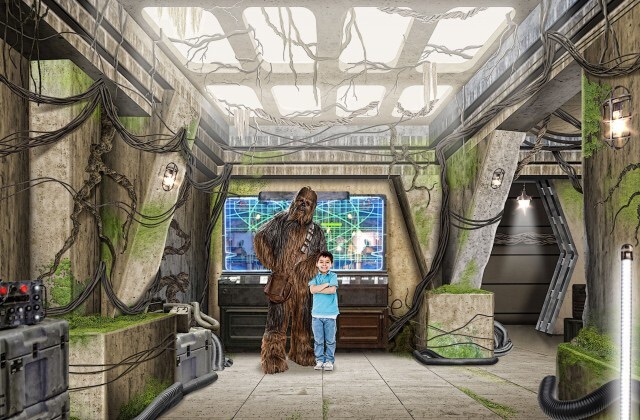 From there, Guests can choose the path of the dark side and encounter Darth Vader in an immersive area themed around the Star Destroyer, or they may choose the path of light side by stepping into a makeshift Rebel base and coming face to face with, Chewbacca. Launch Bay Theater – In this area, Guests will hear directly from the creative minds behind the Star Wars saga in a short video that includes exclusive interviews with the directors, writers, producers and other key movie crew members who bring the saga to life. The Cantina – You knew there would be a Cantina, right? It will be a fun place to explore and take photos near elements of the cantina, such as a holochess table. Star Wars Game Center – Guests can play current and upcoming video games. Oh and one cool aspect is that there will be new Disney Infinity 3.0 content created exclusively for this location that you can only get here. Themed Galleries – Three special galleries will be located throughout Star Wars Launch Bay. Celebration Gallery will feature iconic ships from throughout the Star Wars saga, such as memorable ones of the Rebel Alliance and the Imperial Navy fleet. Celebration Hallway will display large-scale replicas of Star Wars props amid scenic murals. Preview Gallery will offer guests exclusive looks at replicas of props, artifacts and memorabilia from the latest movie in the saga, starting with Star Wars: The Force Awakens. Among the items that will be on display are costumes, ship models, droids and artwork. Launch Bay Cargo – This is a unique shopping area where guests may bring home Star Wars merchandise, including original artwork and collector’s items. Guests can also experience the stories of the saga in this film which will feature scenes from the complete Star Wars universe, as well as giving those who are new to the Star Wars story an opportunity to get acquainted with the films. Guests who have a Chase Disney Visa will be able to feel the power of the Force at the Star Wars Imperial Meet ‘N’ Greet. This opportunity will be offered daily from 11:00 a.m. to 4:00 p.m. at the Star Wars Launch Bay. To access the special meet opportunity, you’ll simply have to present your Disney Visa Credit Card to enter this exclusive location. Guests may come face to face with First Order Stormtroopers who will patrol various areas of the park, interacting with guests during their mission to find members of the Resistance. At night, the park will erupt in a spectacular finish with a dazzling Star Wars-themed fireworks show set to memorable Star Wars music from throughout the saga. The Star Wars Weekends fireworks display was always fantastic, so I imagine this will be just as jaw-dropping. It looks like there will be a lot of great fun for guests to enjoy who want to get their Star Wars on. One thing is for sure though with the introduction of these new updates, Star Wars is already taking over Disney’s Hollywood Studios and this is clearly just the beginning. I’m going to be at the studios on nov. 30. Do you think they’ll be doing testing the day before? They may be testing a few things, but the full role out will be December 1. Any clarity in whether or not these greets are for Disney visa cardholders, if there will be something separate for that, or if the cardholder greet has been scrapped altogether? Thanks! There is supposed to be a separate Disney Visa Darth Vader meet & greet in the courtyard from 11am-4pm daily starting 12/1. Can anyone tell me if they truly hold you to the 6 people maximum in the Disney Visa Card meet n greets? We have 8 in our family. Are they really going to make us leave 2 out? How does the symphony of stars work with Fantasmic shows? Will they occur at different times? Any idea how this will work for planning? During Star Wars Weekends and Frozen Summer Fun, they always ran two Fantasmics with the fireworks. The fireworks were between the two shows. It’s supposed to be easier to see the fireworks and then see the second Fantasmic show. Will the fireworks conflict with the Fantasmic shows? 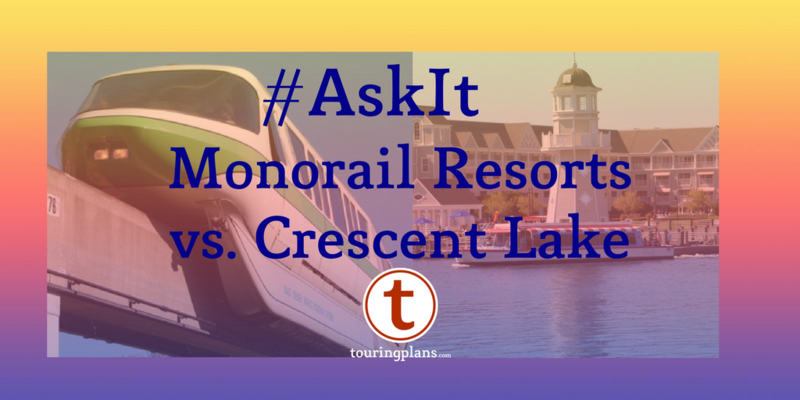 When will these locations be listed on your personalized touring plan software to be included in ones touring plan? We are going April 9, 16. Will we miss all the good StarWars stuff? Nope! A good majority of these things will still be offered in April. A few things may not be, but for the most part, most things are still going to be open.